ARE THEY KILLING BABY HORSES IN ONTARIO, CANADA? Home → Damien Zone → ARE THEY KILLING BABY HORSES IN ONTARIO, CANADA? It has been reported in Ontario, Canada that trotting racehorses are being euthanized at birth because recent legislation has virtually wiped out the industry of harness racing in that Province. The Damien Zone has, in the past, expressed a lot of displeasure with the harness racing industry but this one pretty much puts the nail in the casket. This business of racing horses is really disgusting. It ranks right up there with dog fighting and bull fighting. If this is true, it’s beyond disgusting. TheDamienZone admits when a serious topic requires the know-how of an expert, and in this case, we contracted the services of David Mattia who is a harness racing insider and an internationally respected horse racing journalist. [Roquebrune-sur-Argens, France] – It was recently reported by April Colby QMI Agency in ParisStarOnline.com, an Ontario, Canada based website, that breeders are now euthanizing their foals at birth because the decision to end provincial funding for Ontario’s harness racing will leave them with no market for these newborns. 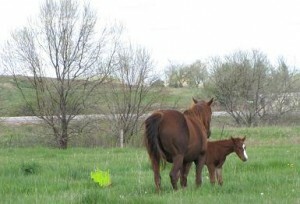 Whether or not this is a widespread trend or if it’s simply an isolated incident that has grown gossipy wings and isn’t true at all, has yet to be determined, but if foals are indeed being disposed of at birth simply because their future value is uncertain, somebody has to give a voice to these foals. I humbly submit to give them my voice. I have always believed that if you can’t afford to own a racehorse come foul, come fair, you should neither own one nor should you breed one . In other words, if you have to work in a supermarket or a shopping mall to make your equine ends meet, or if the future of your breeding business teeters on the precipice of market values, you’re in the wrong business. Owning or breeding racehorses should be left to the wealthy, the kind of “wealthy” wherein losses — even into the hundreds of thousands of dollars — are merely glancing blows, or bothersome paperwork issues that are only noticed by an over-worked accountant. Kindly note that I am not naive about the misdeeds of the well-heeled. On the contrary, I am keenly aware that the horsey elite have often concocted some nasty insurance schemes to recoup losses, and often the very rich display grubby behavior more worthy of a Victorian era street urchin than a socially gregarious heiress running around Monaco. But if you dig deeper, you’ll frequently find that the elite scam artists either don’t have as much money as you think they do, or they came upon their wealth in ways about which you’d rather not think at all. An old racehorse owner once told me, “Don’t count other people’s money.” That advice has never failed me. Still, it never ceases to amaze me just how “broke” rich people – or people rich enough to assume they can own racehorses — can often be. Usually they are more morally broke than they are financially broke, but whichever way you look at it, they’re broke. Anyone who kills a foal simply because a financial loss is in the forecast, is in my opinion, morally broke, and if the racing business survives in Ontario, the guilty should be forever shunned by the racing community in favor of those who stood by their moral obligation to provide for the animals they manufactured. I also believe that if breeders are killing foals to cut losses, they should be brought up on cruelty charges simply because one doesn’t go around killing things. It’s just not something one does without following proper protocol. There are rules of engagement. When you kill wasps with a handy can of wasp killer, you are required to read the warnings and instructions on that can. If you don’t follow the directions properly, or you opt to ignore those instruction, you might — instead of killing wasps — wind up poisoning or killing yourself or others or the environment. Yes, there are even consequences to killing a lowly wasp. How ironic is it that even a dead wasp can still sting you? They are one of the few animals who can reach out from beyond the grave and get you back. Innocent foals, however, do not have this rather grim talent, but who’s to say what kind of karmic cycle might roll over a person who kills a perfectly healthy foal with only the excuse of runaway greed to protect them? In any event, euthanizing a healthy foal, simply because someone is worried that he or she is going to lose money, is criminal. It’s the point at which euthanasia becomes a euphemism for killing. If I see a penniless man with a dog and assume that he has no money to feed that dog, should I shoot the dog or should I shoot the penniless man? If I shoot the penniless man I am promptly arrested and put in jail for the rest of my life, but if I shoot his dog I will not only get some kind of criminal punishment, I will also become the most hated man in that day’s news and perhaps for years to come. A Hollywood screenwriter once gave me a lesson about how to successfully create the character of a villain. In this instance the villains are allegedly killing newborn colts and fillies because they fear red ink. It might be interesting to investigate why we use the term “red ink” to describe a financial loss. Maybe somebody with an inquiring mind will figure out the historical significance of that expression. I imagine it has something to do with blood, but it doesn’t matter. The audience is already leaving. How much can they take? If they’re killing foals, they’re playing to an empty house. Of course there will be people who say, “Do you talk like this when you eat a hamburger or a piece of chicken?” Well, first of all, I don’t talk with my mouth full, but yes, as a matter of fact I absolutely do talk and think about this when I eat the flesh of an animal. Regrettably, the blissful non-existence with which I was totally satisfied for 4 billion odd years, was rudely interrupted by this thing called my life, and in my life I have to eat. I regret profoundly that I am a failed vegetarian, but I do not kill without concern and I never eat meat without a certain amount of remorse. I am also one of those crazy people who believes in God. I don’t pretend to like him, but I believe he exists, and whenever I feel the need to stay alive and eat one of his creatures, I say a quiet little prayer — not for myself — but for the animal who was deprived of its life so that I can live mine. Sometimes an animal turns the tables and chomps down on a human being. Thankfully, in one of his rare displays of mercy and kindness, God has deprived that animal of a conscience. Man-eating animals live out their lives without ever knowing the gnawing pains of regret and remorse, and if by chance a big game hunter happens to end up on the wrong end of the safari, I am totally content to accept the carnage as a simple example of one animal eating another in order to survive. Perhaps I have ventured off my original course, but you have to excuse me. I am trying not to think that foals are being killed because they have been deemed worthless. No human is ordained to make assumptions about which living thing is worthless and which one is not. Throughout my career where I have often had to write about harness racing, I have had to take a whole lot of deep breaths and it’s starting to put a strain on my heart — because I have one. DISCLAIMER: The views expressed by the author of this article do not represent the views of TheDamienZone.com and all of its affiliated companies. The opinions expressed are those of the author. Giorgio Tsoukalos is an ancient astronaut. You should see him shirtless. Gay Lover Falls From Roof. It Could Happen To You -- just like Judy Holliday. I can’t say this is happening or not. I would like to think if it is happening, it is only a few miscreants. That being said, I tend to wonder if this is a story which has been fabricated merely to enrage public opinion in Ontario to try to get the plans of the provincial government over turned. Of course, that is also despicable to use foals as political capital. Damien! This is horrible!! I believe in God and I’m not one to wish very many people to the fires of hell but if this is actually happening…well hell is there for a reason. We have been given a responsibility to rule over AND care for the animals that share this earth with us. I so agree with your comments. Although reading this breaks my heart, thanks for putting it out for all to know. I remind my readers that this was not written by me (Damien LeGallienne) or my co-writer Damian DuMarelle. It was written by David Mattia, a sportswriter who works in the racing industry and purchased by TheDamienZone because we didn’t want it to simply end up in horse racing trade magazines. As a life long groom for these harness race horses, I can only add that being euthanized instead of tortured and then slaughtered while still alive is the lesser of two evils. The large breeding farms are probably the culprits you speak of, the bottom line is just that to them. Most time they send their older mares to cheap slaughter sales after the poor mare has given them no less than 8 to 15 foals. These people need to get out of the breeding business, for good. The business of racing has become a direct reflection of the greed and overt disregard for equine welfare. If it all ends tommorow that will be great. Real horseman and woman will continue the sport of harness racing and lay waste the industry of greedy breeding and racing fools.